1st place: Tracey MacDonald, 2nd place: Paula Tidman, 3rd place we have a tie with Lovely Linda and Suzanne B well done everyone! Can everyone please email Nikky for your blinkies and to claim your prizes please! Please put in the subject field of your email your placing and the challenge number - this will make Nikky's life a lot easier! Now, onto this week's challenge - I would like you all to use a template in your project, It can be a physical one or a digi template, it's up to you. 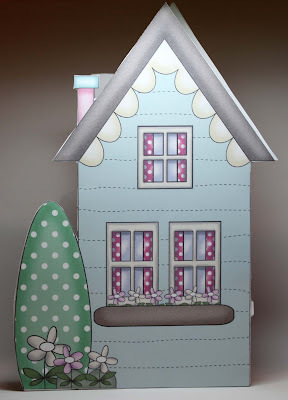 Dee: I've made a toy soldier card for my project this week, although it's from the Paper Boutique Vol II-Creative Christmas it's one that could be used all year round. I simply printed off all the bits and layered it up using silicon glue. 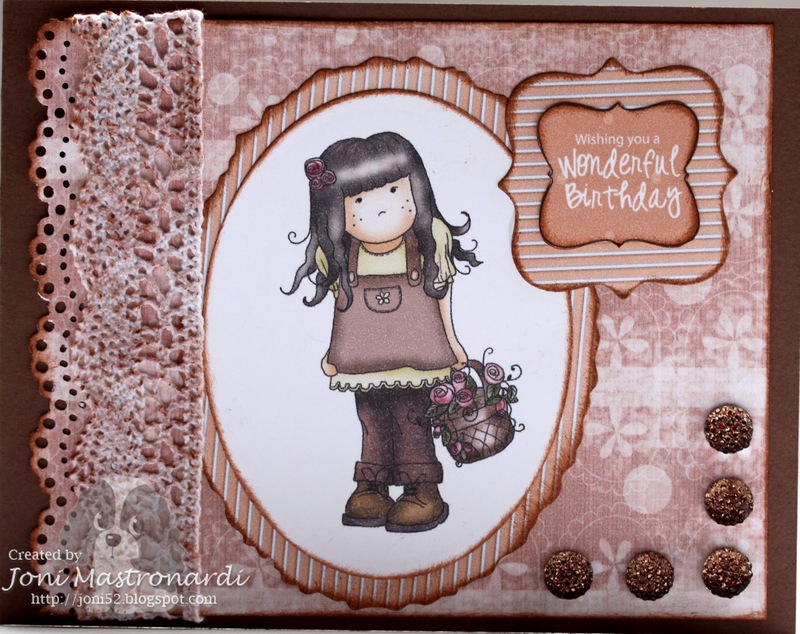 Nelly: I have used the Paper Boutique vol 1 cd and used the Sugary Cake template, placed it on an 8x8 card and cut around. The design papers are also from the cd except the dots the text swirls paper which is from the Sugar Birdies CD and the images are taken from Pretty Sweet CD. I used a Martha Stewart punch to create the border and ribbon and raffia from my stash, the sentiment is from the Pretty Sweet CD. Joni: I used the Paper Boutique 111 CD - the Country Cottage template. 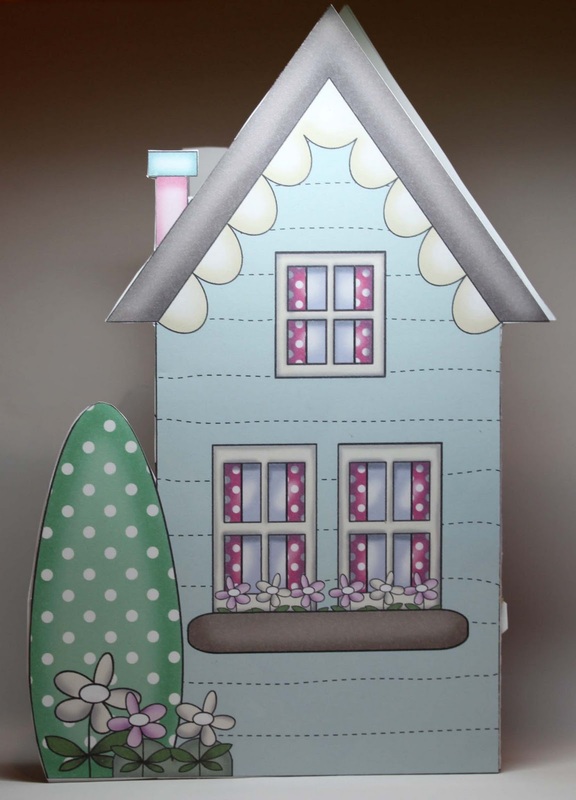 Louise- I have used the paper Boutique Cd for my card this week and printed out the lovely house and then used a character from the Pretty sweet CD. Clare:- I've used the birdhouse template from the Candy Doodles CD. I printed the papers from the Sugar Birdies CD onto card and printed the template onto the back of the papers. 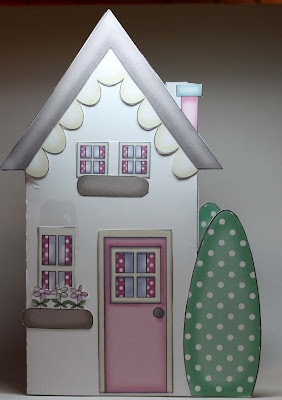 This template makes a really good size birdhouse. I filled the inside with paper flowers and printed out the cute owls from the Sugar Birdies CD. Shary I have used the Paper Boutique Vol 3 for my project. I've done a mixture of using the papers from the CD and I've also printed out some of the elements to colour with copics. The little flowers have been punched out using the papers and I've added a little gem to each flower.The sentiment is also from the same CD. Joanna - I've used a seed packet template from Sundae of Seasons CD, the papers are from Sundae of Seasons and the seed packet image hidden at the back is from Not For Girls CD. 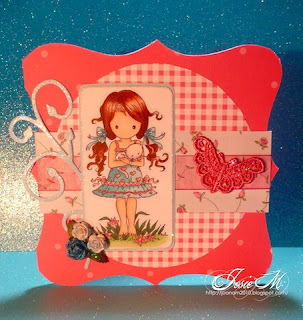 The butterflies are from the Fairy Flutterfly Maxine stamp set and the flowers are a free stamp designed by our talented Nikky for the Craft Stamper. All coloured with Inktense pencils.This template is so versatile! 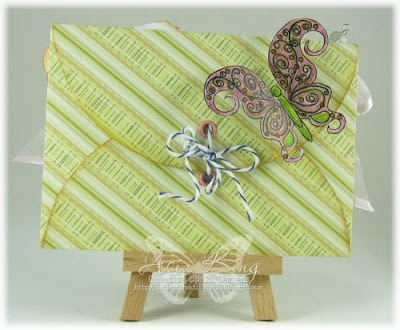 If you'd like to see more inspiration with this template, visit my blog - I have a tutorial, too! Shell-for my card this week I used the cut and create cupcake template off the Paper boutique lll cd, I made a card blank using my nesties, added a few layers and distressed the edges using worn lipstick distress ink then simply added a ribbon and a few pearls. 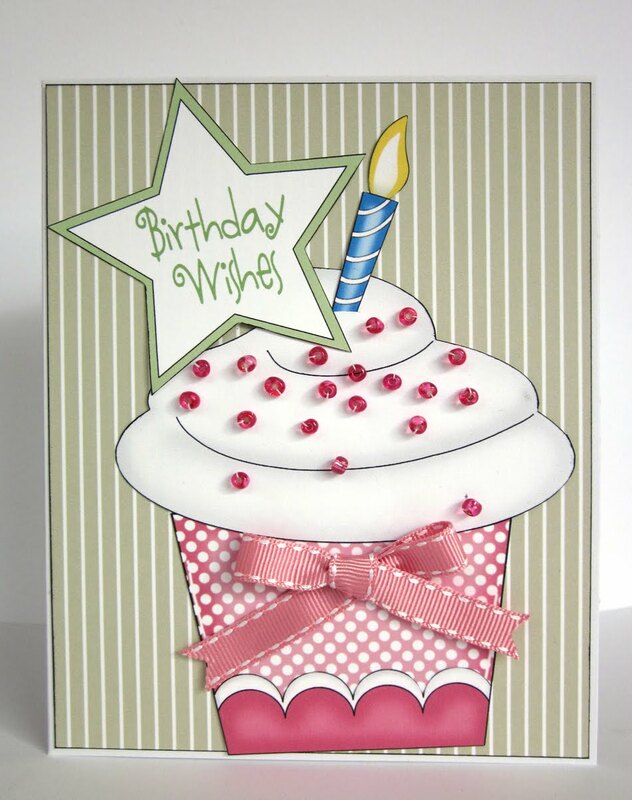 Colette - I have used the green cupcake template from Paper boutique lll and followed the instructions on the CD to make my cupcake shaped card. The stars are covered in glossy accents and I added some string and a button from stash to make it look a bit more masculine. 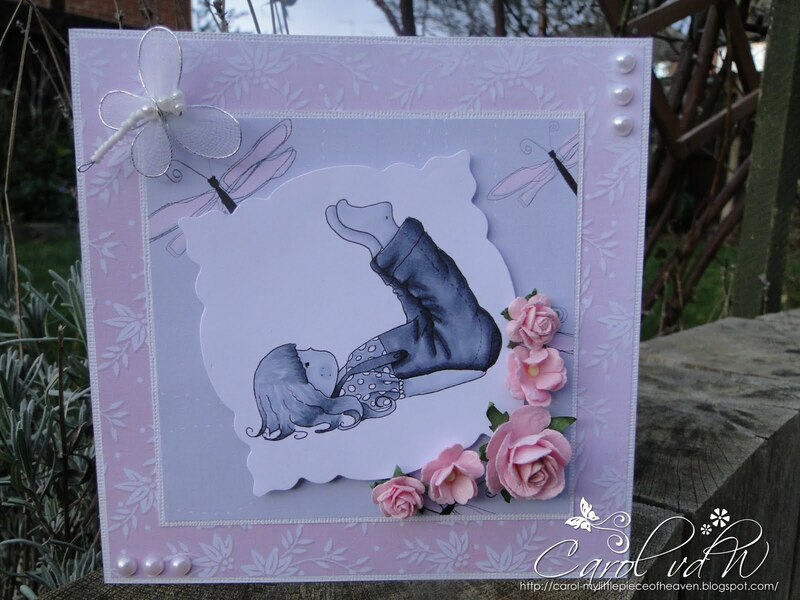 Carol - I have used a template from the Paper Boutique Vol III and decoupaged the layers for more depth. I also added some stardust stickles for some bling. Norine: I used a template from the Paper Boutique 3 CD this week as well as background papers from the Pretty Tuff CD. After cutting and piecing all the pieces, I stitched beads on for sprinkles on the cupcake. So there is our inspiration for this week - some fab and fun projects! Your closing date to enter is Sun 5th Feb at noon GMT. Hello everyone and welcome to another week at Polkadoodles! Woohoo we have a bit of a landmark at Polkadoodles - 1000 Blog followers!! woohooooo!! In celebration of this we will choose 5 random people who leave a comment under this week's post who will each receive a free stamp! But you have to be a follower and you have to leave a comment under the post to qualify. The winners will be announced next week. Before we get down to business this week, did you all know we now have a great Under 16's monthly challenge over at Diddydoodles! We think it's really important to get the youngsters crafting and give them a bit of motivation so if you have young hands that are always in your craft stuff then please get them joining in! It's all a bit of fun but it's run by kids for kids and we would love it if you can help spread the word please. 1st: Jackie and tied as runner ups are Emma, Sandra B, and Lindsey well done everyone, Jackie wins a special set of Grey Flexmarkers and the runners up all win a Digi! Can everyone please email Nikky for your blinkies and to claim your prizes please! So, onto this week's challenge - the sketch! It's my birthday this week so the theme is to make a Birthday Card and follow the sketch. 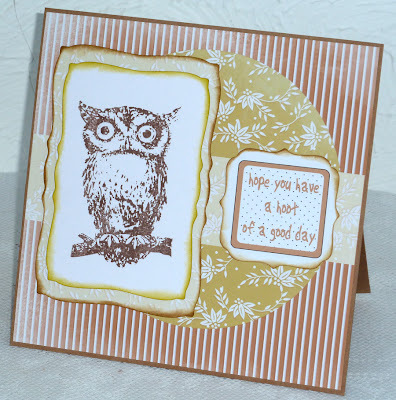 The winner of this challenge will win a free stamp which has not even been released yet so we can't even show you the design, but if you like cute owls you are going to love it!! 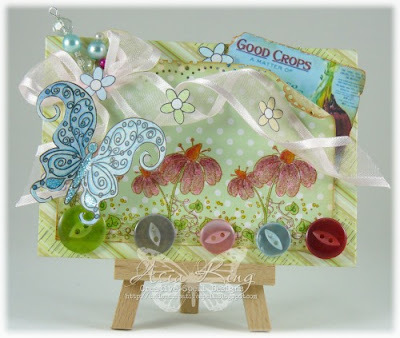 Ruth: I've gone with a round card and I've used two butterflies from Sundae of Seasons and added some wire. The ribbon ruffles are made by simply ruffling up ribbon and sticking it down to some very very sticky foam tape (I think its DIY stuff!) Confession time - I can't remember which cd I printed the paper from!!! Daniele: For my card I used papers from All Around and Everywhere, the bird cage die is from Memory box and I couldn't resist adding feathers. The stamp I have used is from Stampavie but there is also a delightful birdbox on the Cd to go with the papers. Fliss: I'm on a bit of a nature kick with my cards at the moment so my card here is no exception as I wanted to use this really cute owl from Tattered Angels and I thought the papers on the Pretty Sweet CD a perfect match with their shabby look and gorgeous vintage colours. 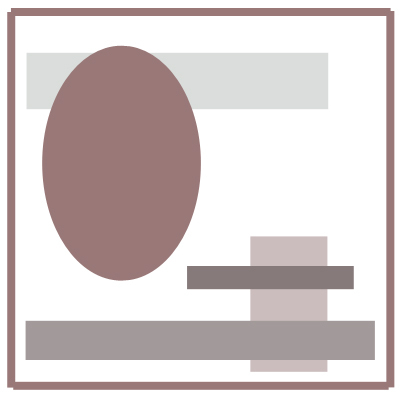 I stamped the owl with Memento Rich Cocoa and left him uncoloured for impact. I added die cut layers and inking on the edges for emphasis. I finished off with a great sentiment from the Back To Nature CD. Miria For my card I used a LOTV stamp coloured with Distress, the papers are from Paper Pretties cd, I just added some buttons. 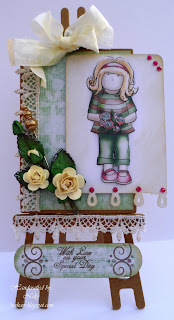 Josie: This week for stash box stamp I used a Lili of the Valley image. I am hooked on the pink and turquoise colours at the moment as well as these papers. They are from the Pretty Sweet and Magical Winter CD Roms. Ashley- For my card I used the Pretty Tuff cd, for the awesome stars and stripes papers and stamp image. 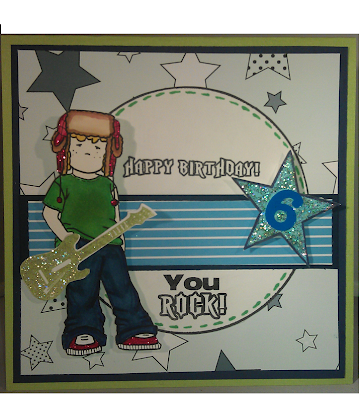 I added some cool PTI stamps to create a fun "rock star" theme. A little glitter here a little glitter there and BAM you have a "ROCKIN" card. Anne...For my card this week I've used papers from Sugar Birdies CD and a stamp from Sparkle n Sprinkle which I've coloured with copics. Some punched flowers and leaves finish the look. ALAN: For this challenge l went straight to Sugar Birdies CD-Roms 'Collectors Edition' for my backing papers. There is such a wide range that can be used for any occasion. 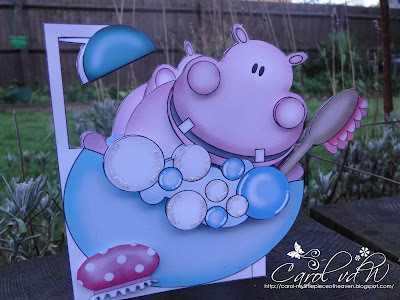 I wanted a softer card creation that l could give to Mum-in-Law on her Birthday. The flowers were again from the Sugar Birdies CD-Rom 'Collectors Edition and were just glued together and a button threaded with Butcher string to give detail. So there you have this week's entries...aren't they fab! You have until Sunday 29th January at noon GMT to enter so make sure you get your entry in to have a chance of winning that candy! Just use the cute little InLinkz button below - all you need to do is add the URL of your image(not your blog post!) on your blog (or Photobucket etc if you don't have a blog) and InLinkz will load your thumbnail. It sometimes takes a little while to refresh so if it doesnt load first time just check a little later on. 1st place: Michaela 2nd place:Pauline 3rd place: Donna - well done to all of you! especially now that comment moderation has a spam section. Hello there everyone, it's Fliss here with the challenge details for this week and I've been a bit naughty as I'm on Team A and this is really a Team B week - tee hee! The reason for this is that my younger daughter will be turning 21 in just a few days and I wanted to pick a theme which she loves as much as I do which is why I chose Vintage or Retro. 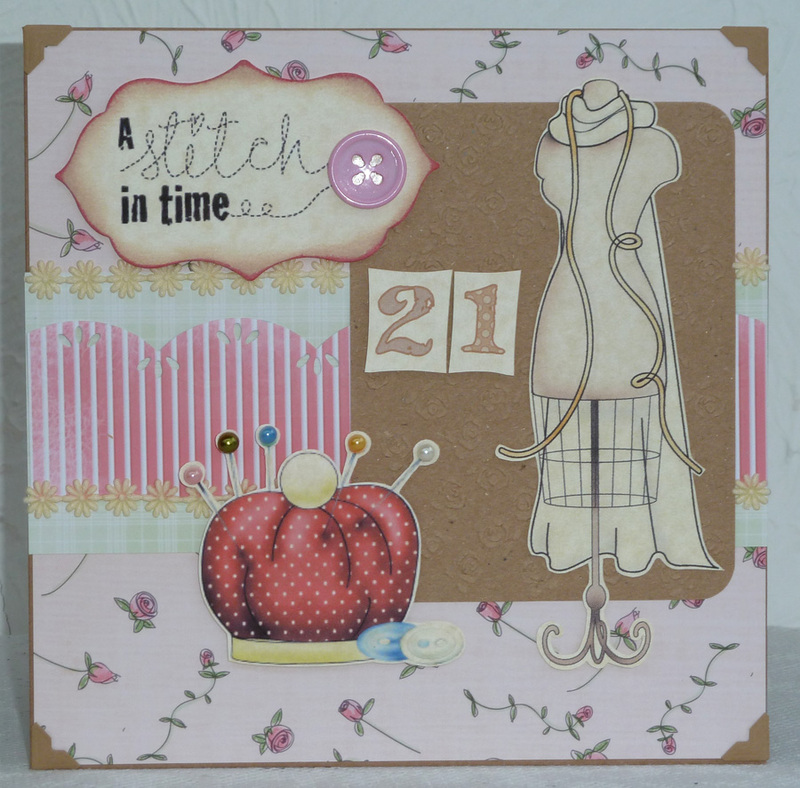 Fliss: My card is Sarah's 21st card and I chose a sewing theme as she's doing a fashion degree. The gorgeous dress form, sentiment and pincushion are from the Sundae Of Seasons CD and I printed them out on beige parchment card for a vintage look. 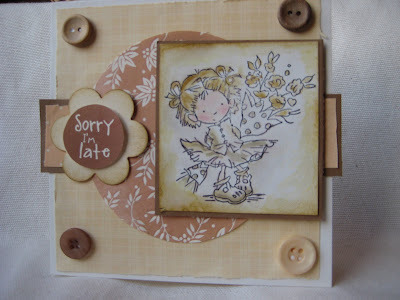 I used papers all from the Pretty Sweet CD and an embossed panel of recycled kraft paper. I finished off with some lovely embellishments. 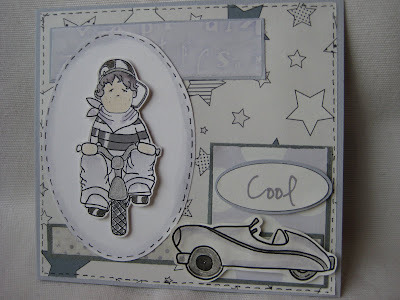 lis-m ; For my card I have used "Pretty Tuff" for the whole thing... i love this little boy image . I have coloured him with Promarkers, and added a couple of buttons to finish. 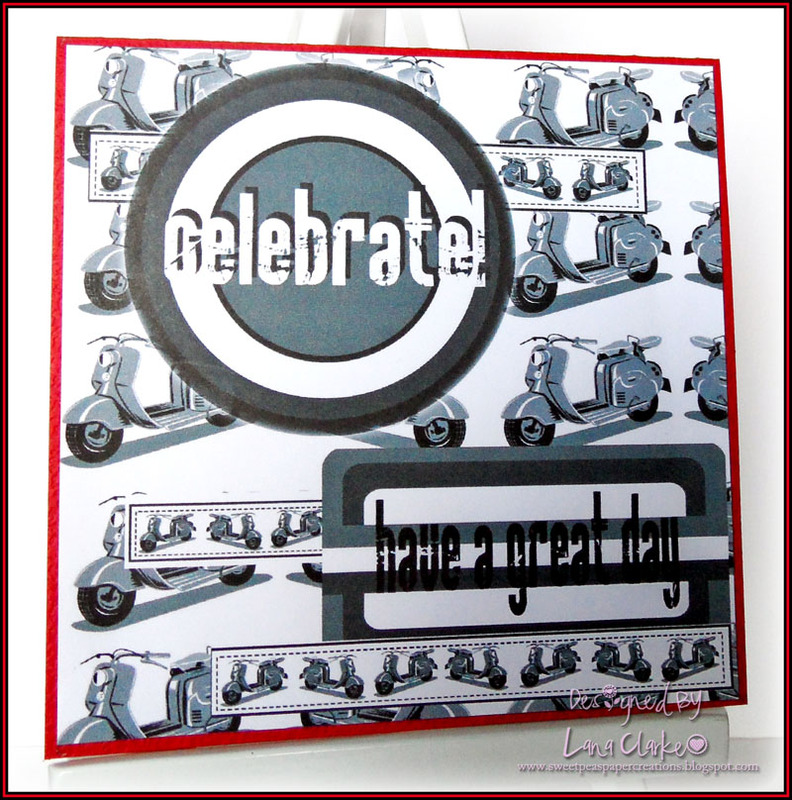 Clare:- I've gone for a sixties feel, retro card. Very plain and simple to fit the sixties style. The papers are from the Polka Doodles "Candy Doodles" CD, the colours were a great match for my Flexmarkers. 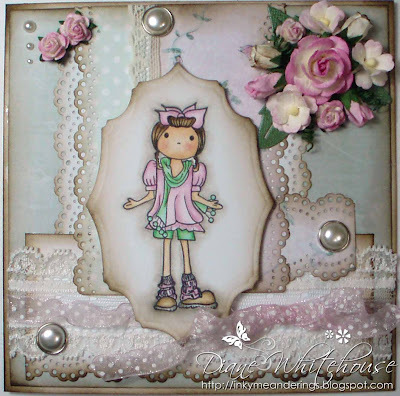 The flowers are black and white stampies from the "Sugar Birdies" CD and the image is from the Polka Doodles "Meeshelle" Fairy Flutterby" rubber stamp set. 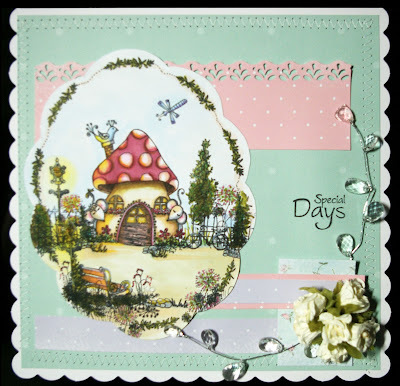 Norine: For my card this week I had fun exploring all the CD's again and decided on a vintage card with paper and images from the Sundae of Seasons CD. 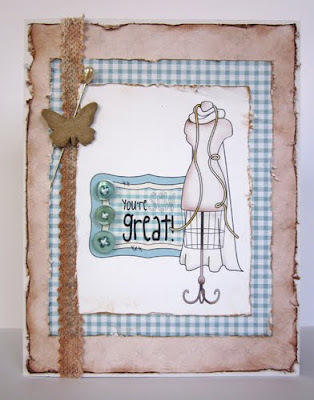 I love the subtle colors and designs and when paired with distressed, inked edges and scruffy lace, you have an easy to make vintage card for almost any occasion. Shell- For my card this week I went with vintage, the Papers and the adorable image are from the Pretty Sweet cd, I have distressed the edges with distress inks, the flowers are die cut using a page from an old book. 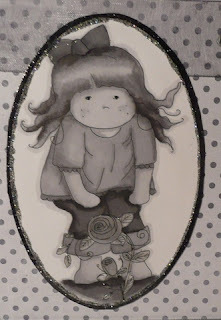 Louise For my card I have used this cute image from the Double sprinkle of kraft CD and coloured with copics. 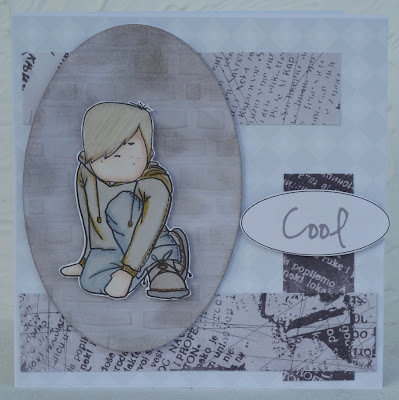 Dee: I've used a selection of papers and a sentiment fro﻿m the mini CD Pretty Sweet this week. 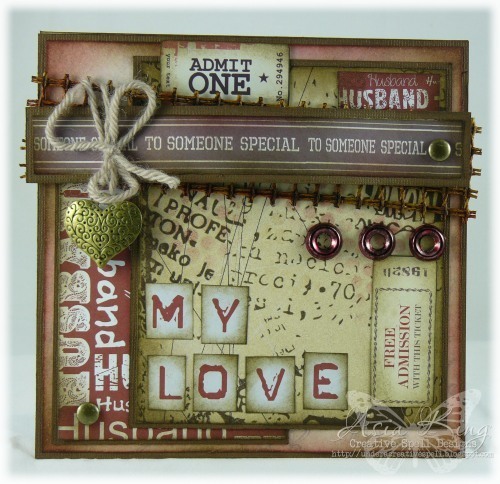 I decided not to use an image and just concentrate on the papers, so I've used quite a few Spellbinder dies. 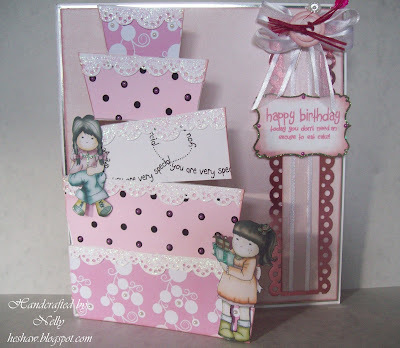 I've even added some of my favourite spotty ribbon to this pretty card. Everything has been edged with an Old Paper distress inkpad. Shary For my card this week I've gone for vintage. I used coordination card and sanded it and embossed it. The papers are from the Pretty Tuff CD and I've distress inked them around the edges. The image is two of the stamps from the Magic Neighbours range. I've coloured them with Copics and lightly gone over with the distress ink. 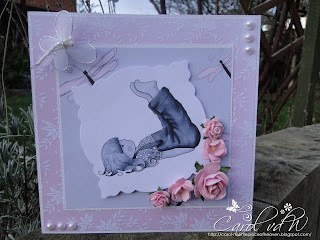 And finally the sentiment is from the Fairy Flutterby Babsie set. I punched the flowers out of the Pretty Tuff papers and inked them too , also adding a little pearl to the middles. Diane My card this week uses the stamp Fairy Flutterfly Babsie and I've coloured her with Copics and Prisma pencils and given her a very girly, vintage setting. All the papers are from the Pretty Sweet Mini CD Collection. Joanna: For this week's vintage theme I looked for inspiration in Not For Girls CD and oh boy, this CD is full of vintage goodness! My papers are a mixture of Not For Girls and Paper Boutique vol III CDs and the tickets, sentiment and alphas are from Not For Girls CD. A lot of distressing with distress inks later and my card was finished! ;). 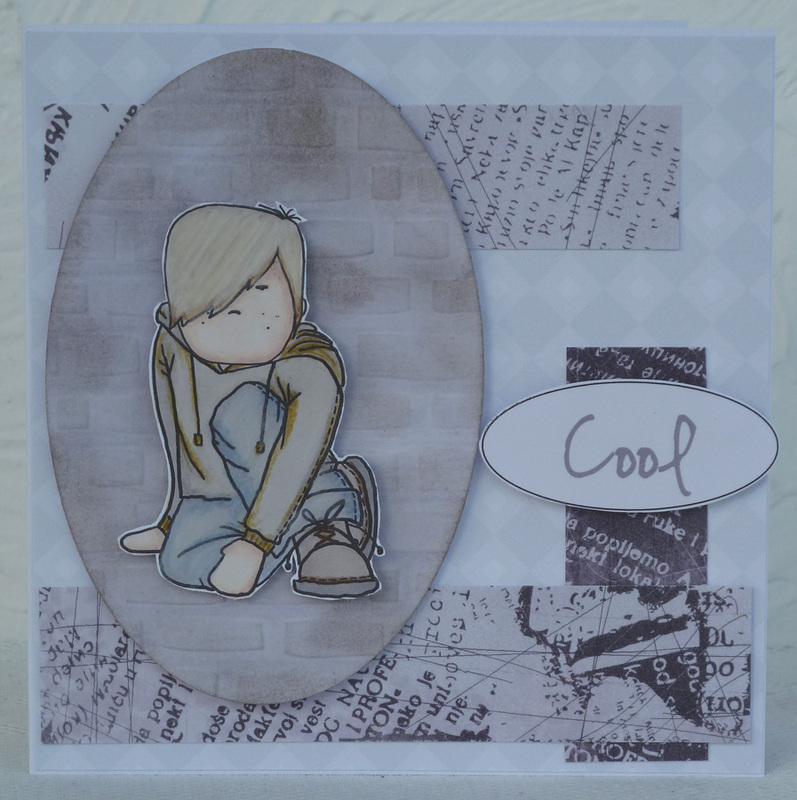 Carol : This week I decided to use the Pretty Sweet cd rom and printed these dps off as well as the image which I have coloured in with Copics. Colette For my vintage card I have used the Not for Girls CD's printed one of the plain papers onto my card for the background and then layered more papers and the vintage cars poster on top. I have added some grosgrain ribbon, brads and a mini bulldog clip to finish it off. ry to order your kit, so get in now to make sure you can get hold of yours! 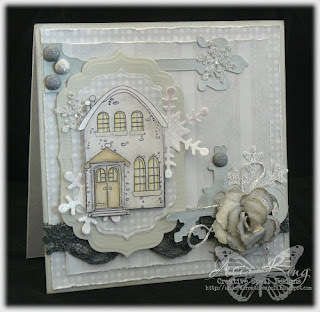 Also, make sure you tune into Create and Craft TV (if you can't get it you can see it on www.catchup.tv) on Sat 7th Jan at 11am and 4pm for lots more ideas and inspiration with Nikky! 1st place: Julie B, 2nd place: Neli, 3rd place: Pauline - well done to all of you! Please email Nikky for your blinkies - the first placed winner receives a £10 voucher to spend in the Polkadoodles shop!! Please put in the subject field of your email your placing and the challenge number - this will make Nikky's life a lot easier! It's my turn - Nikky - to set this week's challenge and for this one the lovely peeps at Letraset have kindly donated a special set of Flexmarkers which I've asked them to put together for us...all in shades of Grey! The challenge runs until Sunday 15 January at 12noon GMT. You can see a tutorial on my blog for the colouring for this one and also the samples which used Greys in the magazine features here. Josie: Loved this challenge for the sketch but also the colour shades. I recently got all the grey Pro Markers and this was good practice. First of all I printed the backing paper from the Pretty Tuff CD Rom, then I took the image from the Pretty Sweet CD Rom. I coloured the image, the ribbon and the flowers with my grey Pro Markers. On the rose in the image I went over it with a clear Wink of stella glitter pen and glossy accents on top of that. I then added a Craftworks Sentiment and some Frou Frou Bling. Daniele, what a great challenge, I have used images and papers from The Love & Cherish Cd to create this anniversary card, adding a feather and grey pearls for a touch of bling. Anne - I used the Not For Girls Definitely For Men CD and started by colouring up the image using my copic markers. Then It was a simply a print job with these fabulous papers. I also loaded the plain grey papers into my graphics programme and added my own text to match ( or as near as I could) so it all matched. Some brads, eyelets and a bit of white cord for the embellies and I was sorted. Lana - For my card I have used papers and toppers from the 'Not for Girls Definitely for Men CD. 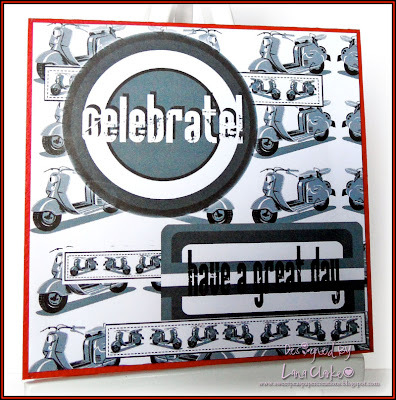 I was worried when I realised we needed to make our creations in shades of Grey as I love bright and colourful cards, however I think the mod scooter images are perfect for this challenge. I did the complete card using Photoshop. Doreen - For my card I used the image frome the fantastic Pretty Sweet CD Rom and the paper is from the Pretty Tuff CD Rom. I embellished with ribbon, lace and flowers. I love the monochromatic look. Miria For my card I used images, sentiment and papers from Pretty Tuff. I coloured Claude and the car with Zig Art&Graphic Twin and Wink of stella. Joanna - For my card I used papers from the Sundae of Seasons CD and the stamp from the Neighbours range. The image was coloured with water colour pencils and cosmic shimmer water colour paints. To embellish the card I used lots of die cuts and glitter! Claire - Loved this challenge Nikky. Gave me the chance to use up some papers I'd printed from Not for Girls cd alongside the cute dog from the Pretty Tuff cd coloured with promarkers, a little added doodling and crackle glaze. Fliss - The image, sentiment and background paper on my card perfect for the boys in the family came from the fabulous Pretty Tuff CD and the script paper from the Not For Girls CD. My oval panel was embossed with a brick wall folder and inked with Pumice Stone Distress ink. My image was coloured first with Promarkers in all the shades of grey I possess and I then added some detail with Prisma pencils. 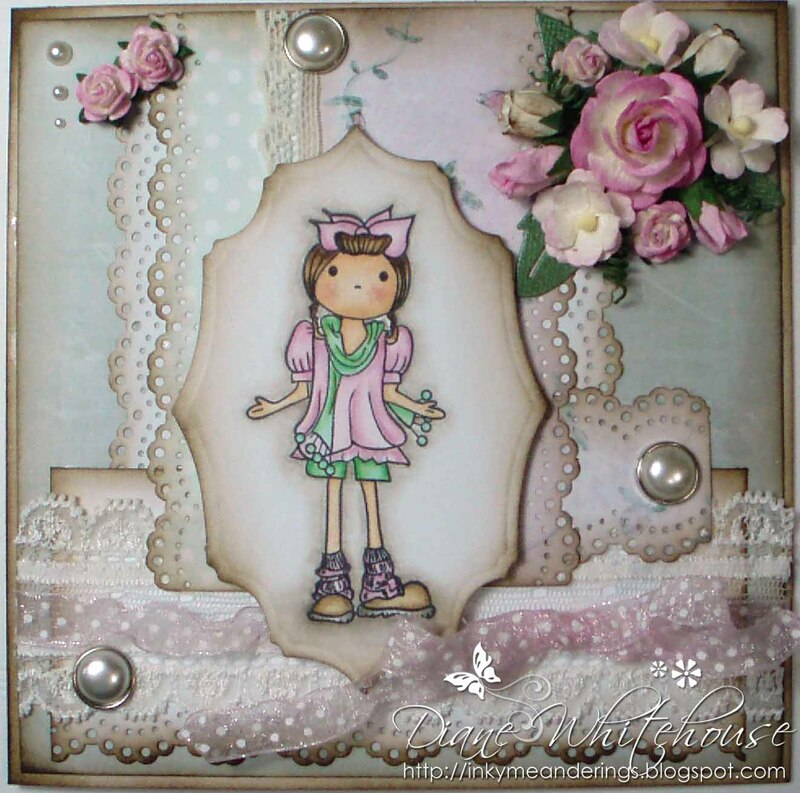 Ruth: I've delved way back into the Polkadoodle archives and used Not For Girls cd for all my card plus a bit of embossed acetate (you can just about see it!) plus some buttons and embroidery thread from my stash. ts stuck down so I guess I am. Alan: For this Challenge l used the FAB cd PRETTY TUFF. 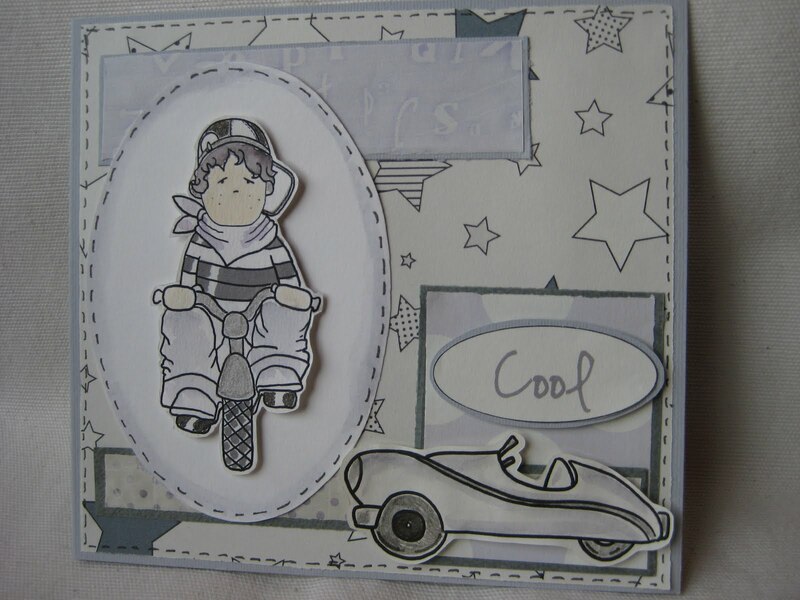 Has loads of images that you can build and create a card for those Men/Boys in your social circle. I tried to keep it clean. All the papers and images were worked on using a simple D.T.P that we all have access to and normally some are free to get hold of. Any questions please ask. will reply a.s.a.p Happy crafting in 2012 you all. Good luck with the challenge (please remember our rules!) 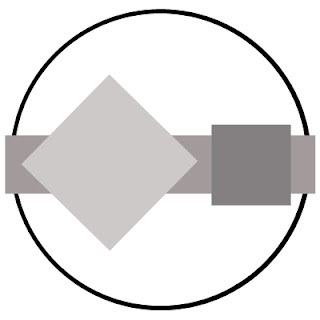 and the deadline for entries is Sunday 15 January at 12noon GMT.